Set Includes: 1 x Bed Runner. Material Content: 100% Pure Polyester. 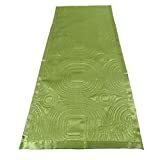 This luxurious soft Bed Runner has a wonderful satin embossed design to both sides. This unique Bed Runner is machine washable and would finish any Bedroom to a high standard.